The Belmont Link Motorway is a tiny mysterious proposal, initially known only from a single map in the National Archives in Kew, and it's almost certainly a misfile. It's found in file MT112/67, whose title is "Traffic signs on motorways and major roads proposed numbering of motorways" - which indeed is exactly what the rest of the documents stored there are all about. Suddenly somewhere in the middle was a mysterious undated map, though its of early 1960s style which fits with the date of the file. All that we had to go on was a poot quality base map, and "Belmont Link Motorway - North-South Motorway to A675 Higher Walton". Where the heck is that then? Well, the "North-South Motorway" bit is easy - that's the M6 in Lancashire, which narrowed the field somewhat. Then it was a matter of working out where the A675 was - which turned out to be the route southeast from Preston to Bolton. So, looking at the route of A675, and there was Higher Walton - just east of the M6. And for a long time, that was it. The entire knowledge of the Belmont Link Motorway in one simple set. Without any corroboration, that was it. It sat in the file marked "Huh? Must check later..." for quite some time - much like the road itself, research on it was consdered to be a low priority. Not quite. Whilst research into the Link itself progressed, in the words of Edmund Blackadder, at the speed of an asthmatic ant carrying some heavy shopping, it occasionally turned up in other things. Firstly, the Preston Bypass opening brochure (which can be seen over on CBRD) shows the Belmont Link Motorway, though the scale on the map shows no detail and it is described simply within a paragraph as a "motorway link...to the Belmont - Bolton Road"
Not really - but it confirmed that this was a real proposal, not just some blue-sky thinking that ended up being accidentally archived. The next bit to turn up was in the 1960 Lancashire Roads Situation Report, where the Belmont Link Motorway is described as "joining the Preston Bypass at Prospect Hill, then continuing eastwards for about half a mile to terminate on the Preston - Belmont road A675 at Higher Walton." Not much extra there, except for a confirmation of the location of the junction with the M6 - just north of where the M61 now joins - but a couple of paragraphs further down is interesting. The appropriate Order determining the line of the Belmont Link has already been made by the County Council and confirmed by the Minister of Transport. This meant that not only was it not just blue-sky thinking, but that it had gone far further through the planning process than anyone had imagined. So, how far did it get? That, I'm afraid to say, is as far as the story currently goes. We simply don't know, though there's no mention of it in the "fossil record" yet found that's from later than the mid-1960s. However, there is one more document that mentions the Belmont Link Motorway by its name. And this one is really a bang head on desk moment. Why is that? It's not like you to get frustrated like that. Yeah, well, I forgot something. Somewhere really, really obvious to those of us that are road historians. It's the blueprint for all early post-war road proposals in that part of the world, the 1949 Road Plan for Lancashire. Annoyingly, there it is - both in the text and on that nice big map inside the back cover, going by the snappy title of "Route 223". It's described as "Short Motorway Link from Route 1 [M6] in Walton-le-Dale, to Route 222 [A675] in Higher Walton. Dual 2-lane carriageways are proposed." Which, to be fair, pretty much describes it off to a tee. There is, however, a postscript to the story. In the late 1960s, New Towns were springing up all over the country. One that didn't get very far, however, was the Central Lancashire New Town. You can tell how far it got by the way it never ended up with a proper name! Anyway, the New Town was basically the area around Preston, Leyland and Chorley and as a result the area was expected to grow massively, and become the major economic driver for this part of Lancashire. This then would have had a knock-on effect around the towns east of the area - Blackburn, Burnley and so on, who were then expected to be more closely linked with Preston than the Manchester area. So, roads needed to be improved between Preston and Blackburn... Sound familiar? Hang on a minute - the M65! 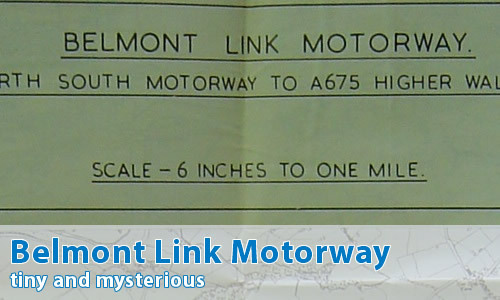 Whilst it's not true to say that the M65 is simply an "grown-up" Belmont Link Motorway, it is interesting that the westernmost section of the Calder Valley Fast Route (as it started life) was almost exactly on the line of the Belmont Link Motorway. Today, of course, the actual constructed M65 is to the south of here, joing the M6 south of the M61 junction instead of north of it, but that's a whole other story. OK, can you show me the route?